On May 12, 2012, The Root held the inaugural event for its Black, Fit and Healthy Series at the Prince George's County Sports and Learning Complex in Landover, Md. Between seminars, sports clinics and words of wisdom from our special guest, Olympic gymnast Dominique Dawes, we sought to further the conversation about health and fitness in our community. The Root's deputy editor, Lauren Williams; publisher, Donna Byrd; and managing editor, Sheryl Huggins Salomon (far right), pose with Dominique Dawes, who is co-chair of the President's Council on Fitness, Sports & Nutrition. Health coach Willa Peterson (far right) offered a juicing demonstration. Dominique Dawes signed autographs for some happy kids at The Root's tent at the Glenarden Track Club's Invitational Meet, which was also held at the Sports and Learning Complex on May 12. Dominique Dawes poses with fans. Attendees line up to meet and greet Dominique Dawes. The gold medalist offered tips on fitness and healthy eating during a motivational speech to her fans. An excited young audience member captures Dominique Dawes' speech on her cellphone. Young athletes are ready for Dominique Dawes' gymnastics clinic. The young participants take in the instructions. Dominique Dawes helps a young girl with her tumbling. 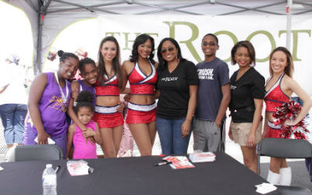 Three of the Wizard Girls, the cheerleaders for the Washington Wizards, came out to sign autographs at The Root tent. The Wizard Girls spoke to The Root about their favorite ways to exercise. Of course, dancing was high on the list. Young fans, along with The Root's deputy editor, Lauren Williams (center right), and managing editor, Sheryl Huggins Salomon (second from right), pose with the Wizard Girls.